My four-year-old goddaughter joined my dad and I on the Alzheimer's walk this year, the three of us made up Team Gracious Goodbyes. As her nanny for four years, M and I have been on many walks and I knew she would be just fine on this one. Her parents had explained to her that she was going to spend the day with me and that we were going to go on a special walk for Grandma. M has spent many days over the past four years going to the nursing home with me to see "Grandma Jeannette", so she is aware that Grandma is sick and unable to care for herself. So when she asked why Grandma needed a special walk, I explained that we wanted to help raise money so we could give it to scientists to find a cure for Grandma's illness. I told her that we didn't want others to be sick like Grandma. 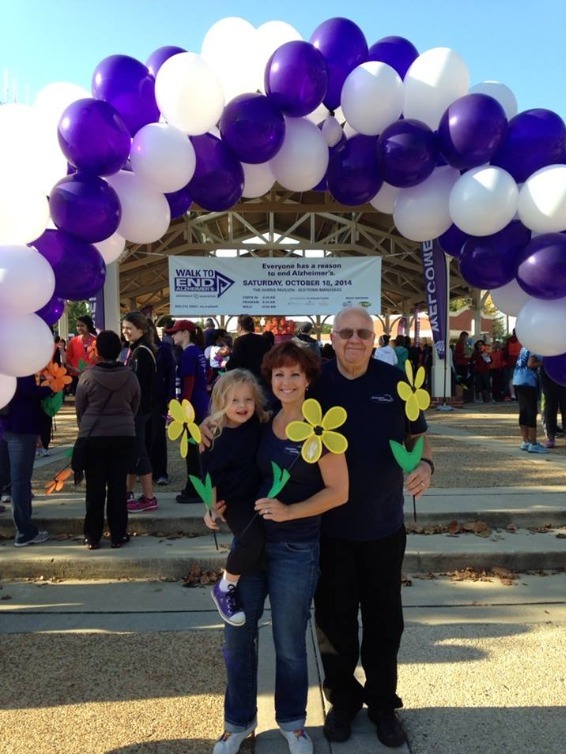 We had a perfect Virginia October day for our Walk to End Alzheimer's and M was in her element with the throngs of peope, pictures being taken and tables giving away pencils and balls. She happily donned her Gracious Goodbyes t-shirt, smiled for the camera under the balloons and headed out down the road to sing, crunch the leaves and proudly carry her Azlheimer's yellow pinwheel flower in honor of Grandma. We arrived back at the pavilion after 1 mile, 1 fall, a few tears, 1 lollipop (Grandpa always has those) and brief rides on Nanny's shoulders and in the stroller. And in the pavillion,...there was music...and M began to dance. She swayed, twirled, hopped and galloped to the music, unencumbered by what anyone might have thought of her. She found another little girl, took her hand and swayed and twirled with her, and occasionally I joined them and swayed and twirled as well (I'm too uptight to do that without a 4-year-old). Mostly, though, I just watched, basking in the purity and joy of the moment...a moment I would never forget. A moment my mother would have loved. A moment that made my heart ache with missing her and being unable to share that moment with her. She would have loved little M...and would have danced with her, uncumbered by what anyone else would have thought. It was a moment that reminded me why I walk to end Alzheimer's...so that one day, no one else will need to walk...they'll simply be able to dance. Someday ....... It's ba long roa and dancing along the way sounds like a good way to keep hope in our heart.